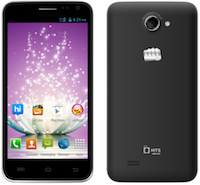 Within days of Micromax's quad-core phablet offering Canvas 2.2 A114 cropping up on a number of e-commerce sites, the homegrown handset manufacturer has further expanded its Canvas range of smartphones with Canvas Blaze. Launched in partnership with MTS India, the mobile telecom service brand of Sistema Shyam TeleServices Ltd (SSTL), the dual-SIM smartphone is available for purchase for a price of Rs 10,999. MTS is also offering bundled services with the device that include 2GB of free data per month, 1,000 minutes of free MTS to MTS local calling, and 2 hours of free calling to other local and STD numbers. The bundled services are applicable for six months from the date of purchase, and will only be available through the MTS SIM that the company will provide (along with the smartphone) at the time of purchase. Users will need to place the SIM in the first SIM slot, while they can use their existing numbers in the second slot. The smartphone sports a 5 inch TFT capacitive touchscreen display (480x854 pixel resolution) and runs on the Android 4.1.2 Jelly Bean operating system. It is powered by a 1GHz dual-core MSM8625 processor and has 768MB of RAM. The internal memory of the device is 4GB (out of which 1.88GB is for app data and 1GB for user data) that can be further expanded up to 32GB with a microSD card. Canvas Blaze has an 8 mega pixel auto-focus rear camera with Flash that can also record videos, and a 0.3MP front facing camera for video calls. On the connectivity front, it has Bluetooth 2.0, Wi-Fi, 3G and it also comes with a USB 2.0 port and a microSD card slot. The dimensions of the device are 147.5mm x 74mm x 9.9mm. Micromax has provided an 1850mAh battery in the device that it claims will provide up to 5 hours of talk time and 120 Hours of stand by time. It comes with dual-SIM (GSM + CDMA) capability, has GPS (with A-GPS support) and a FM radio. The company has also preloaded a number of applications in the device that include MTS TV, Spuul, Opera, Hungama music, and M! Live, among others. In terms of its pricing, the smartphone's competition in the Indian market will include Samsung Galaxy S Duos 2 S7582 (Rs 10,790), XOLO Q900 (Rs 11,499), Karbonn S5 Titanium (Rs 9,999), LG Optimus L5 II Dual E455 (Rs 10,149), and iBall Quadro Andi 5h (Rs 10,599), among others.